CHAIRMAN: Before counsel for the Tribunal opens the matters in relation to which evidence will be adduced at this week’s sittings, I wish to refer briefly to the matter of the health of Mr. Charles Haughey. On foot of the matters that have already been referred to in public sittings, the Tribunal has arranged examinations of Mr. Haughey by two suitably qualified medical consultants. The need for the latter examination became apparent only upon receipt of the initial report. The latter of these two reports has only come to hand in extremely recent days. In the context of insuring fairness to Mr. Haughey and seeking to ensure, as far as possible, that all relevant medical data necessary to ground an informed view on this important matter are considered, I am deferring, until Thursday at these sittings, a more detailed statement in relation to this matter. On that occasion, it is proposed that what has transpired will be set forth along with what is intended in relation to the ongoing involvement with this Tribunal of Mr. Haughey. Now, Sir, the evidence in these sittings will cover a number of distinct areas, not directly relating to one another. In the main it will relate to evidence already given at earlier sittings in connection with a number of different matters. The first matter I want to mention is the evidence of Mr. Joseph Malone. You will recall, Sir, that an affidavit of Mr. Malone’s was opened in the last sittings and it was indicated at those sittings that in due course Mr. Malone will be giving evidence along the lines of his affidavit and if necessary an amplification of his affidavit and this evidence, the Tribunal expects to be able to call in the next few days. I want to mention evidence to be given by Mr. Tony Traynor. The Tribunal has had a number of dealings with Mr. Traynor, the son of the late Mr. Desmond Traynor. Mr. Tony Traynor has already given evidence to the Tribunal and he has provided the Tribunal with a considerable amount of assistance concerning his knowledge of his father’s dealings with Mr. Haughey and he will be giving evidence very briefly in the course of these sittings in connection with his knowledge of his father’s regular meetings with Mr. Haughey at Mr. Haughey’s home. You will recall that Mr. Haughey has given evidence concerning his recollection of the extent of his dealings with the late Mr. Traynor. From Mr. Haughey’s evidence, it would appear that their dealings were not necessarily very regular or very frequent. Mr. Tony Traynor has now provided the Tribunal with further information concerning this matter. This is limited to what was stated to him by his father and is based on information he has obtained, having consulted with his mother and other members of his family. He has informed the Tribunal that his recollection is that his father used to meet with Mr. Haughey at Mr. Haughey’s house in Abbeville on Saturday mornings very frequently, perhaps most Saturday mornings, but at least on two Saturday mornings per month on average. His recollection is that his father would be away from the family home on those Saturday mornings for at least two hours. He also recalls that sometimes his father met with Mr. Haughey on Sundays. His recollection is that these meetings appear to have taken place up to the time of his father’s death in 1994 and he does not recall any change in the pattern of the meetings up to that time. He has no knowledge of any of the matters discussed at the meetings between his late father and Mr. Haughey as his father never spoke to him or any member of his family about these details. The next separate or distinct item I want to mention concerns the evidence of Ms. Eimear Mulhearn. The Tribunal has requested the assistance of Ms. Mulhearn as the daughter of Mr. and Mrs. Haughey and therefore one of the connected persons within the meaning of the Tribunal’s Terms of Reference, in connection with dealings between Abbeville Stud and Mr. Fustok. It will be recalled that evidence was given by Dr. John O’Connell and subsequently indeed by Mr. Haughey himself, concerning a payment of £50,000 made by Mr. Fustok through the agency of Dr. John O’Connell to Mr. Charles Haughey. The Tribunal was informed that this payment was in respect of the purchase price of a horse sold by Mr. Haughey to Mr. Fustok. While the Tribunal has obtained some information from Mr. Fustok, Mr. Fustok has failed to respond to a number of queries concerning this matter and other aspects of his relationship with Mr. Haughey. As Mr. Fustok is outside of the jurisdiction, the Tribunal cannot compel him to give evidence. Mrs. Mulhearn was involved and has, for some considerable time, been involved in the day-to-day running of Abbeville Stud and the Tribunal has addressed a number of queries to her, through her solicitors, concerning her dealings whether on behalf of her father Mr. Haughey or otherwise, with Mr. Fustok concerning the manner in which the purchase of a horse by Mr. Fustok was recorded in the records of Abbeville Stud and concerning the manner in which the receipt of £50,000 in payment for a horse was recorded in the records of the stud. Mrs. Mulhearn has responded to the Tribunal on foot of requests for information concerning records at Abbeville Stud to the effect that the records for the relevant year are not available. It would appear that the records of Abbeville Stud are not kept for a period of greater than six years and this, so the Tribunal has been informed by Mrs. Mulhearn’s solicitor, applies both to the financial or accounting records and to the records which one might expect a stud to keep of the horses the stud has kept of any breeding of those horses. The Tribunal will wish to pursue with Mrs. Mulhearn why this policy of six-year destruction was persisted in, notwithstanding the fact that this Tribunal had been set up, and the Tribunal will of course also wish to pursue with her memory, such as it is, of these or any similar transactions. 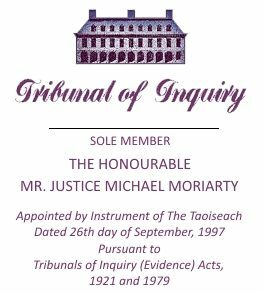 Now, I want to come to evidence which the Tribunal expects to be given concerning Princes Investments and in particular a loan made by Guinness & Mahon to Princes Investments Limited, a company with which Mr. John Byrne and Mr. Thomas Clifford and his late brother were involved or associated. You will recall, Sir, that evidence has already been given by Mr. Byrne and by Mr. Tom Clifford in relation to the activities of this company and in relation to a loan made to this company by Guinness & Mahon. You will also recall, Sir, that evidence was given by a number of witnesses concerning a related transaction or related transactions involving a company known as Central Tourist Holdings, and attention was drawn to the similarities between the manner in which the loan made by Guinness & Mahon to Central Tourist Holdings and the loan made by Guinness & Mahon to Princes Investment were dealt with and in each case there were some very unusual similarities which have already been the subject of evidence. The Tribunal’s interest in this matter arose from a lodgment of £260,000 in July of 1987 to an account of Amiens Securities Limited in Guinness & Mahon. This was one of the series of Amiens accounts controlled by the late Mr. Traynor and was an account which was frequently used by Mr. Traynor for the purposes of routing funds lodged to or drawn from the account for what appears to have been the benefit of Mr. Charles Haughey. Shortly before that, £260,000 lodgment in late May and early June of 1987, the account appears to have been used by Mr. Traynor to channel the proceeds of the Tripleplan cheque which were ultimately applied to discharge the outstanding balance on Mr. Haughey’s no. 1 current account with Guinness & Mahon. It will be recalled from the evidence of Ms. Sandra Kells that that lodgment of £260,000 represented the proceeds of a banker’s payment drawn on Allied Irish Bank, and as I think the Tribunal of may have pointed out on a number of occasions, a banker’s payment is an instrument which is used between banks where the payee of a cheque requires value on the cheque more promptly than within the usual four days required for a cheque to pass through the clearing process. Resulting from the Orders of the Tribunal made against Allied Irish Banks and from, as you will recall, Sir, the most exhaustive searches carried out by Allied Irish Bank, it appeared that the source of this payment was a debit to an account in the Tralee branch of Allied Irish Banks in the name of Princes Investments. This is a company with which, as I have said, Mr. Byrne and Mr. Clifford are associated and indeed of which Mr. John Byrne and Mr. Thomas Clifford are directors and is the company which operates the Mount Brandon Hotel. The Tribunal was informed by Mr. Byrne and Mr. Clifford that the £260,000 payment was made to discharge a loan made by Guinness & Mahon to Princes. The Tribunal heard evidence from Ms. Sandra Kells regarding this loan from which it appears that in July of 1987 when the funds were lodged to the Amiens Securities account, there was, in fact, no loan outstanding by Princes Investments to Guinness & Mahon and indeed, there had been no loan outstanding for nearly two years. It also appears from evidence given by Ms. Sandra Kells that the loan was, in fact, discharged, as I have said, some two years earlier on the 4th September 1985 with funds transferred from a Guinness Mahon Cayman Trust account, that is, transferred from an Ansbacher account. Between September of 1985 when Ansbacher had discharged the loan and July of 1987 when the £260,000 payment was made, fictitious account statements were generated showing a loan or purporting to show a loan to Princes Investments. It would appear that these fictitious account statements were manually forced from the Guinness & Mahon computer system, there being, in fact, no way that the computer would have generated them automatically, and these in turn enabled Guinness & Mahon personnel to issue interest certificates purporting to suggest that interest had accrued on loans which didn’t, in fact, exist. It will be recalled that the Tribunal heard evidence in March last that an identical process appears to have occurred within Guinness & Mahon, as I have already said, in the case of a loan to Central Tourist Holdings, a company of which, as I have indicated, Mr. Byrne and Mr. Clifford were directors and of which Mr. Denis Foley TD was also a director. That loan was also discharged on the 4th September with funds transferred from the self same Guinness Mahon Cayman Trust account. In other words, the self same Ansbacher account and once again fictitious statements were also generated and fictitious certificates of interest issued in respect of that loan in the period after the discharge of the loan by Ansbacher. The Tribunal heard evidence last June from Mr. Clifford and from Mr. Byrne. Both Mr. Clifford and Mr. Byrne stated that they were not aware that the loan from Guinness & Mahon to Princes Investments was a back-to-back loan. They did not know, in other words, that the loan was secured in the form which the Tribunal has described time and again by an Ansbacher deposit secured in such a way that on the records of Guinness & Mahon, there was no clear or express reference to the security but only a coded reference to the security of the kind which we have come across time and again. Mr. Byrne and Mr. Clifford stated that they did not know that funds from Guinness Mahon Cayman Trust, i.e. that Ansbacher funds, had been used to discharge the loan. They stated that they did not know who might have been the beneficiary of these funds. They stated that as far as they were concerned, the loan was in fact still outstanding until July of 1987 when it was discharged with a payment of £260,000. The Tribunal will be hearing further evidence from Mr. Clifford and Mr. John Byrne regarding this matter and will also be hearing evidence from Mr. Jack Stakelum. It will be recalled that the interest certificates which were issued by Guinness & Mahon in November of 1985 and November of 1986 were addressed to Princes Investments Limited care of Business Enterprises Limited, a company which was controlled by Mr. Jack Stakelum. Mr. Stakelum has informed the Tribunal that he has no knowledge of the loan from Guinness & Mahon to Princes Investments, no knowledge of the repayment of the loan in September of 1985 or the payment of £260,000 by Princes Investments in July of 1987. He has also informed the Tribunal that prior to 1975 when he was a partner in Haughey Boland, he was involved in setting up the accounting systems for Princes Investments and he was, at that time, involved in the auditing of the company’s accounts. After he left Haughey Boland, he had no further involvement in the affairs of Princes Investments as such, that is to say no further involvement in the affairs of the company as such, but he did have a continuing role in managing the private funds of both Mr. Thomas Clifford and his brother Mr. William Clifford and indeed evidence has been given by Mr. Thomas Clifford that he relied on Mr. Stakelum as a general adviser. The private funds under the control of Mr. Stakelum, were placed by Mr. Stakelum with Mr. Traynor and it was Mr. Stakelum’s belief that these funds, that is to say the Clifford private funds, were held by Guinness Mahon Cayman Trust. Mr. Stakelum has informed the Tribunal that he was never asked by Mr. Traynor for the agreement of the Cliffords that their funds should be used to back a Princes Investments loan. Furthermore, he has stated that he was never asked by Mr. Traynor nor did he ever agree that any of the funds controlled by Mr. Stakelum and held for the benefit of the Cliffords should be used to repay the Princes Investments loan in September of 1985. Mr. Stakelum believes that if Guinness Mahon Cayman Trust funds were used for that purpose, in other words, if Ansbacher funds containing some of his clients’ monies were used for that purpose, it is unlikely that he would not have been aware of it. He says that if those funds were used, it is unlikely that they would have involved the Cliffords’ funds. He has further informed the Tribunal that he was never approached by Mr. Traynor for his clients’ agreement that their funds should be used for such a purpose and as he received regular information from Mr. Traynor about the funds under his control, any discrepancy in these funds would have come to his attention. Mr. Stakelum’s dealings with Mr. Traynor in relation to Mr. Clifford and his dealings, if any, in connection with Mr. Clifford’s funds will be pursued in the course of evidence with a view to amplifying further the possible connections between or the potential connections, if any, between those funds and the dealings Princes Investments had with Guinness & Mahon. Mr. Clifford has informed the Tribunal that he commenced giving money to Mr. Stakelum in 1976 and that he understood that this money was later placed in an offshore fund. Insofar as he is aware, Mr. Stakelum never organised back-to-back arrangements on his behalf or never organised any back-to-back arrangement on behalf of Princes Investments. He has reiterated that he has no knowledge of the repayment of the Princes Investment loan in 1985 and he has further informed the Tribunal that he never authorised Mr. Stakelum to use offshore monies belonging to him for that purpose and that such monies were not used to pay off the loan due by the company with which he was associated, Princes Investments, to Guinness & Mahon. It will be obvious, therefore, that there are continuing questions to be answered in relation to the unusual manner in which this Princes Investments loan was discharged and the fact that none of the principals in the company, so far as the evidence to date goes, appears to have any knowledge of how the company with which they were associated achieved such a marked reduction in its indebtedness in 1985 from a source with which, so far as the evidence goes, none of them had any association. The Tribunal will be also hearing evidence, at least hopefully hearing evidence from Mr. John Byrne in relation to this matter. The next item I want to mention is concerning Allied Irish Banks, and specifically further evidence relating to the conduct of the business of Allied Irish Banks with respect to Mr. Charles Haughey’s affairs. It will be recalled that the Tribunal’s first opening statement and its first sittings were devoted in considerable part to the operation of Mr. Haughey’s bank accounts with Allied Irish Banks. It will also be recalled that Mr. Haughey himself gave evidence in relation to his relationship with Allied Irish Banks during the 1970s and the early part of the 1980s. It will also be recalled that in February of 1999, during the course of evidence from an official of Allied Irish Banks, Mr. Haughey’s counsel on behalf of Mr. Haughey drew attention to the fact that it would not be appropriate for Allied Irish Banks officials to give evidence in relation to, what I might call, comparable debt situations to that of Mr. Haughey without reference to specific cases. Mr. Haughey’s counsel indicated that he wished to see how Allied Irish Banks dealt with accounts which may have been in difficulty around the same time as Mr. Haughey’s difficulties arose, some with assets equal to or greater than the assets in the case of Mr. Haughey or some with assets less than the assets of Mr. Haughey. The Tribunal has directed an examination by Allied Irish Banks of a number of accounts which appear to be comparable in this sense and has directed Allied Irish Banks to extract from those accounts a smaller number of what the Tribunal now believes are fairly representative cases. Evidence will be given in relation to the manner in which the bank dealt with these cases. It is important to bear in mind that what is involved in this portion of the inquiry is the manner in which the bank acted, not the dealings of — or not the manner in which any of the individual clients acted. The Tribunal has not had access to details of the identities of the clients and indeed to do so would impose an intolerable burden on the Tribunal if it were to examine a vast range of bank accounts, involving notice to a large number of lenders over a very long period of time. At the direction of the Tribunal, the bank has examined a vast number of applications for loans or for renewals of loans where the bank was lending large sums of money to personal, as opposed to, corporate lenders. The Tribunal has focused on personal borrowings involving lenders engaged either in the agricultural sector or engaged partly in the agricultural sector and partly in other sectors. The object of the searches being directed by the Tribunal was to identify borrowings in or around 1979 and 1980 of the order of those extended to Mr. Haughey where settlements were reached involving either write-offs or the forgiving of large amounts of interest as would appear to have been the case in respect of Mr. Haughey’s borrowings. Mr. Vincent Clifford, an official of the bank, has provided the Tribunal with evidence concerning the material details of eight cases involving personal, that is non-corporate borrowings, where there were substantial write-offs. These eight cases indicate the enforcement strategies adopted by the bank in the case of large personal borrowings in or around the time the bank reached a compromise agreement with Mr. Haughey. From the information made available by Mr. Clifford it would appear that in most of these cases, the bank lent funds for purposes connected with the operation of or the expansion of agricultural activities. In the late 1970s and the early 1980s, it will be recalled that agricultural land was at a premium and very high prices were being paid by farmers seeking to extend their holdings or to extend activities on their existing holdings. What the Tribunal has to consider is whether there were differences, and if so, whether these differences were material, between the manner in which the bank dealt with Mr. Haughey’s borrowings and the manner in which it dealt with other large borrowings around the same time. The Tribunal has assumed that in the cases to be mentioned in the evidence of Mr. Clifford, the bank’s dealings were strictly commercial and the ultimate settlements were prompted by essentially commercial considerations. What the Tribunal has to determine is whether the differences, if any, between the manner in which those cases were dealt with and the manner in which Mr. Haughey’s case was dealt with were prompted by considerations other than commercial considerations. It’s important to point out, of course, that the bank may not have extended any particular indulgence to Mr. Haughey but may have been forced to deal with him on what, for the moment may be described as a more indulgent basis than the basis upon which they dealt with other borrowers. The bank may have been forced, for reasons which the Tribunal will have to inquire into, to deal more tenderly with Mr. Haughey inasmuch as the factors surrounding his position and the connections he had did not arise in the case of other borrowers. In relation to the type of borrowing involved in these eight cases, it would appear that the activities being funded were investment activities as distinct from the activity or the borrowing in Mr. Haughey’s case, which was unsanctioned and appears primarily to have been to fund his ordinary day-to-day activities. It would also appear that in these cases, as indeed in many of the other cases, the details of which will not be mentioned, many borrowers were forced to sell lands and to reduce their overall wealth markedly in order to perform their side of the compromise arrangements entered into with the bank. In many cases there were, as far as the Tribunal can see there were sales of land or huge diminutions in the overall wealth of borrowers in order to meet the bank’s requirements. One of the factors which should be borne in mind in relation to these cases is that they involve the making of judgments by the bank as regards the investments for which the borrowings were being made; judgments as to the value of the investments and the capacity of the borrowers to repay. Ultimately, of course, whether by reasoning of changing economic circumstances or otherwise, these judgments which were no doubt calculated judgments, proved to have been misplaced. From the evidence which has been given to date, it does not appear that there were any similar judgments made in Mr. Haughey’s case. Now, I want to come to the last matter the Tribunal intends to deal with in the course of these sittings and this concerns Dr. Garret Fitzgerald. This evidence arises out of a query raised once again by Mr. Haughey’s counsel in the course of the evidence given by officials of Allied Irish Banks in February of 1999. Mr. Haughey’s counsel requested, through the Sole Member, whether Allied Irish Banks had any other politicians on their books. Mr. Haughey’s counsel was signalling the possible relevance of the manner in which Allied Irish Banks dealt with other politicians by comparison with the manner in which the bank dealt with his client, Mr. Charles Haughey. The Tribunal was not necessarily convinced at that stage, that it would be relevant to examine the manner in which Allied Irish Banks dealt with the indebtedness of other politicians, but in any case, the Tribunal’s consideration of the matter was overtaken by events in that sometime shortly after these matters were raised at the Tribunal’s public sittings, reports appeared in the newspapers concerning dealings between Allied Irish Banks and another former Taoiseach, Dr. Garret Fitzgerald. I hasten to add that there is no suggestion that Allied Irish Banks or indeed Mr. Charles Haughey were responsible for these reports which appear to have been the result of leaks. But the fact remains that ultimately Dr. Fitzgerald was prompted to issue a statement concerning his dealings with Allied Irish Banks. Those dealings involved a significant indebtedness and the ultimate settlement of those indebtednesses on a basis which involved a write-off. The Tribunal contacted Dr. Fitzgerald with a view to examining the matter. Dr. Fitzgerald provided the Tribunal with total cooperation in relation to this matter and has provided the Tribunal with every assistance in endeavouring to examine the circumstances of his settlement and all of the material documents. Before the Tribunal made contact with Dr. Fitzgerald in relation to this matter, most of the material facts were already in the public domain. Dr. Fitzgerald’s dealings with Allied Irish Banks were not contemporaneous with those of Mr. Haughey inasmuch as they occurred in the early 1990s and not in the late 70s or early 1980s. Although Dr. Fitzgerald was not in power at the time of the indebtedness which resulted in a settlement with Allied Irish Banks, there are useful similarities and differences between the manner in which Dr. Fitzgerald’s indebtedness was dealt with and the manner in which the indebtedness of Mr. Haughey — and indeed, as I have indicated, some of the other borrowers dealing with the bank were dealt with by Allied Irish Banks. Dr. Fitzgerald has informed the Tribunal that after his resignation as Taoiseach and also as leader of Fine Gael in 1987, he was approached by Guinness Peat Aviation with an offer to join that company’s Board. As a member of Board he was entitled to buy preference shares. These shares carried special dividend rights which enabled him to convert them into ordinary shares. Dr. Fitzgerald purchased these preference shares and ultimately purchased a substantial shareholding in Guinness Peat Aviation and in order to fund this purchase, he obtained significant borrowings from Allied Irish Banks. At the time these borrowings were incurred, confidence in GPA was high and Dr. Fitzgerald, as well as being a director of GPA, had a number of other sources of income from lecturing, journalism and consultancy which left him with substantial annual earnings. By 1993, he owed Allied Irish Banks in or about £170,000. It had been his intention originally to discharge the capital sums borrowed out of the proceeds of the disposal of his GPA shares. With the collapse of the GPA public offer in mid-1992, he was, of course, faced with a serious problem in relation to discharging these debts, in that the only substantial asset he possessed was his family home at 30 Palmerstown Road in Dublin. He decided that he would have to continue with a fairly demanding work load and indeed would have to increase this work load and that he would also have to contemplate disposing of assets. He retained advisers to deal with the matter on his behalf, in particular, the services of an accountant and a former banker and ultimately reached a settlement with Allied Irish Banks on the 17th November of 1993 which involved the payment of £40,000 amounting to a 22.5% of the total amount of the debt outstanding, together with an assignment of the shares which were then much depreciated in value. In order to fund this settlement, Dr. Fitzgerald entered into an agreement with his son whereby his son agreed to purchase at an independent valuation, his only asset, his home at Palmerstown Road subject to the carrying out of certain works which were designed to enable Dr. Fitzgerald to continue to be accommodated in a top floor flat to be used as an apartment for himself and his late wife at a rent of £6,000 per year for six years and rent free thereafter. The construction of the additional accommodation and the clearing of the mortgage to which the house was then subject left him with a net residue of £30,000. After the settlement with Allied Irish Banks in the sum of £40,000, Dr. Fitzgerald, like many of the borrowers or the unidentified borrowers who will be mentioned in Mr. Clifford’s evidence, was left with a marked reduction in his net asset wealth. In his case, he had lost his family home and was left with a tenancy interest in the property. CHAIRMAN: Thank you, Mr. Healy. .